Fat Hog & Big Pan Catering - Wedding catering advice tips and ideas for barn, marquee and DIY weddings. One of the biggest problems we find in this lovely weather is if you are doing your own drinks in the day is people aren't considering water for their guests between the service and sitting down for the meal. Even if you have some other non-alcoholic drinks in this weather people still want water to rehydrate themselves. Please make sure your buy some plastic glasses and a jug or two; or bottles of water and put them in a bucket with Hessian lining and some cold water. If you don't you guests will take the water glasses off the table (not their own usually the glass closest to them in the room). The caterers are busy preparing your lovely food and don't want guests walking through the kitchen or filling up lots of glasses. When your guests do sit down many will be complaining they don't have a water glass. As these are hired there are not any/very few spare. As it's the is the busiest it’s extremely difficult to get them washed up and back on the tables whilst doing everything else. Just by having bottles of water in a bucket of cold water or plastic cups and a jug means - means caterers can put this out for your guests in-between the arrival drinks and sitting down for the meal without it causing any problems later on. And you guests will be very happy and hydrated throughout the day. Having a DIY always seems like a great idea. Everyone loves a wedding with free alcohol and it's always appreciated by the guests. It seems like a great idea because you also can spend the money on alcohol rather than bar hire. However there are some basic things you must remember and plan for as if you don't it could all end up being a bit of a mess. 1. Glass hire. If you hire glasses don't forget that you can get them for free from Sainsbury's and Waitrose - remember you have to clean all of them before you return them. Also allow time to clean them before you put them out as we find many of them are dirty when you pick them up. 2. Bar staff. Have dedicated people running the bar in all evening - even if it is your nephew or cousins friends. Get them to restock the bar, clear the glasses and tidy up the mess as you go along to prevent a nightmare clear up the next day. 3. Plastic cups. Have 300 backup plastic cups. These are always needed as it's very difficult without bar staff to keep on top of the washing up of glasses. We would advise that wash up the glasses as you clear them away, don't reuse them and get people to reuse plastic so it's less clearing up the next day. 4. Water. Make sure water and glasses/plastic cups are available between the ceremony and meal as people will get very thirsty and you don't want them taking glasses off the tables. Some past customers have put Hessian in a basket and filled it with cold water and put water inside so guests can just help themselves. You never know hot it's going to be and you don't want guests getting dehydrated. 5. Corks. If you buy wine for the tables try to get screw tops. If you have corks make sure you have several corkscrews. Make sure whoever is opening them is aware and given a good amount of time to get them all opened before they are put on the tables. Also although random glass bottles may look beautiful instead of jugs for the water they only serve enough water for 3 people maximum and they must be thoroughly cleaned before use. Looking for informal wedding catering that’s not the 1980’s sausages and sandwich buffet on tin tray with paper plates? 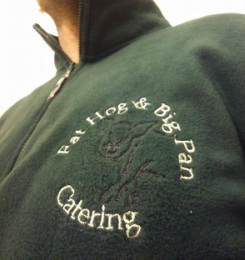 Fat Hog and Big Pan Catering can help! Informal wedding catering is becoming more popular as people are looking for a relaxed wedding, where their guests (including the children) can all enjoy themselves. Many people find that a 3 course sit down meal followed by speeches is just too formal and even the adults start to wriggle in their seats. In addition people are getting fussier and the amount of guests that allergies is higher than ever before meaning that guests can’t all have the set plated meal that was once given out. Fat Hog and Big Pan offer an alternative to the traditional sit down meal bringing you a range of refined high-end modern catering options for weddings, wherever they are. We offer interactive DIY informal high-end buffet style catering for hog roasts, lamb roasts, Hampshire roasts, big pan options e.g. paellas, chilli Thai green curry; they all come with a vast range of accompaniments allowing guests to create their own meal. Or you can create your own bespoke menu. As well as offering full catering packages including canapés, starters, desserts and evening buffets. Customers can choice the amount of courses they want, food options and style. The fresh food can be prepared and cooked in front of the guests, allowing them to see and smell their meal before they even sit down. The 120+ portions of food is then displayed in giant wooden bowls and baskets with an array sauces and chutneys in Kilner jars across two tiers. Guests then work their way along taking the meat they want, salads they want, potatoes they want, sauces they want, bread they want ending up with their ‘perfect’ meal. This style of food really makes it a feature of the day – which you want it to be as it’s usually one of the biggest costs. Informal food brings a relaxed atmosphere as it becomes the conversation topic; each person discusses what they choose; which sauce is the best. Having informal food doesn’t mean you can’t have a seating plan, favours, centre pieces and all the other traditions; the only difference is instead of the ready-made plate of food being brought out to your guests they go can go up and collect it. And if you are happy to your guests can go back for seconds and thirds until the food is all gone. 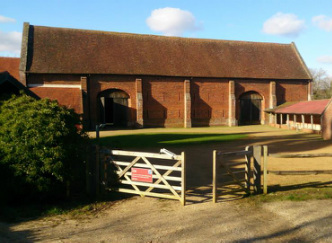 As mobile caterers we do not require a kitchen, we able to caterer at barns to a marquee in the middle of a field. We bring our own catering tent, equipment and buffet display. All you need to bring is the guests. 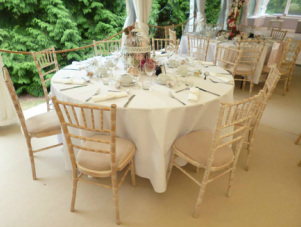 We also offer a full catering options and services; clearing up the tables and helping with the drinks at the tables. Another Hog Roast? Is often what you will hear from many guests attending wedding. Over the last few years the popularity of hog roasts have risen with many hotels and in-house caterers at barns offering as part of their wedding packages. However it’s very unlikely that your guests will actually be hogged out as a whole hog is not something that people have every day neither to do they go to a wedding every day. So although they may have had a hog roast at a wedding before don’t assume that means they don’t want it again. If you are worried your guests might be hogged out but want a hog roast then choose a hog roast with a twist! Most people traditionally have their hog spit roasted which gives you a roasted meat similar to that at home. However at Fat Hog and Big Pan Catering we use a confit oven which really slowly cooked the meat while the heat naturally circulates continuously around the oven. As the hog slowly cooks it naturally takes in all the tasty juices making the meat extremely succulent creating pulled pork. We also make sure our hog roast looks amazing when guests come up by serving it with 10 chutneys all in Kilner jars, potatoes, salads served in giant baskets full of colour, home-made stuffing and variety of freshly bakes breads on a two tier rustic display. It’s a great informal option making the food part and feature of the day – which you want it to be as it’s usually a large cost of the wedding. Seeing the display of 120 portions of food beautiful presented makes your guests excited about the food before they have even eaten it. Still not sure about a hog roast? It’s okay you can be different as Fat Hog and Big Pan Catering now offer lamb roasts, beef roasts and Hampshire mixed roasts – the best of everything. We also have alternative wedding packages, BBQs, lamb kebabs and big pan options.